You asked, and we listened! Due to high demand, we now accept SRS funds for your Retirement Goals and General Investing portfolios. Due to SRS's long-term nature, funding a goal with SRS is only available for Retirement Goals and General Investing. To start investing your SRS funds, create a new goal, and then select SRS as the way you want to fund your account. And remember: you only have until the end of the year to contribute towards your SRS account to reduce your 2018 taxable income. Have questions? There’s a lot to know about SRS, so that’s ok! Below, you can check out some of the FAQ we’ve already received from some of you. Or, as always, reach out to our customer support team at support@stashaway.sg. Or, WhatsApp us here. First, what’s an SRS account? The Singapore government started the Supplementary Retirement Scheme (SRS) to complement the Central Provident Fund (CPF) to help the population meet its financial needs for retirement. SRS is an effective tool to reduce tax payments while saving up for retirement. Unlike with CPF, participation in SRS is entirely voluntary. Think you're interested? Find out if an SRS account is right for you. How do I open an SRS account? You can visit DBS, OCBC, or UOB to open an SRS account, but you aren’t limited to those three banks to invest your SRS contributions. You can start investing those funds with us immediately. 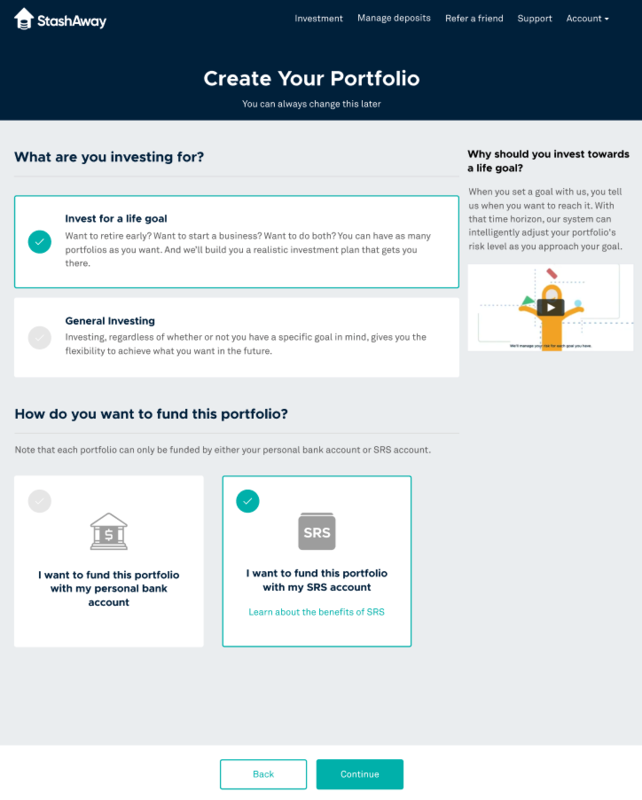 Can I invest in any portfolio with my SRS funds? Due to the long-term nature of SRS, only Retirement and General Investing portfolios can be funded with SRS funds. What are the costs involved with investing my SRS funds with StashAway? Nothing different here. We apply the same low fee structure to SRS funds: annual management fees between just 0.2% and 0.8%, depending on your overall StashAway account balance. There are no subscription fees, no redemption fees, no custodian fees, and no penalty fees.